With the holiday season upon us, many of us have a long list of things to do to get ready for the festivities. Today I’ll be sharing some smart tips to keep the season full of merry & cheer… and hopefully (mostly) free of anxiety. From reeling in your expectations to choosing smart snacks (like Optimum Nutrition products from Walmart), keep reading for my best tips. While we may have grand visions of trimming the tree while chocolate chip cookies are baking in the oven and children are engaging in some festive craft on the table, reality is not always that pretty. Sometimes the cookies will burn and the craft will result in a big pile of glitter on the floor. Keep your expectations in check and just enjoy the simple moments of the season… even if they’re not picture-perfect! During the holiday season, I find that my schedule is especially hectic on a daily basis. 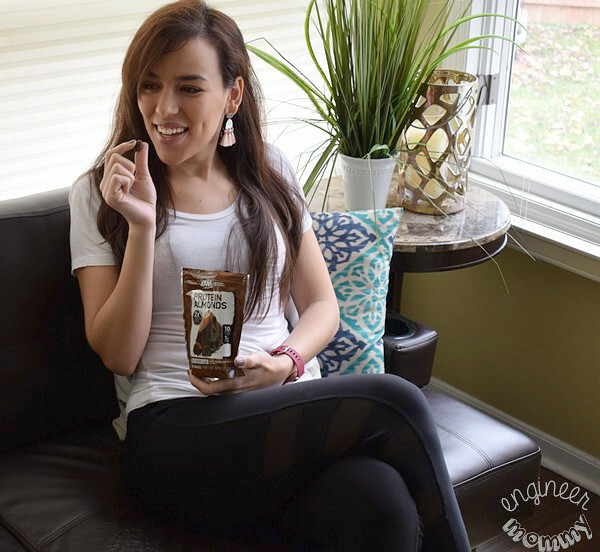 Throw in marathon shopping trips to the mall for holiday gifts and extra work load on the blog in Q4… and the need for convenient snacks is real! 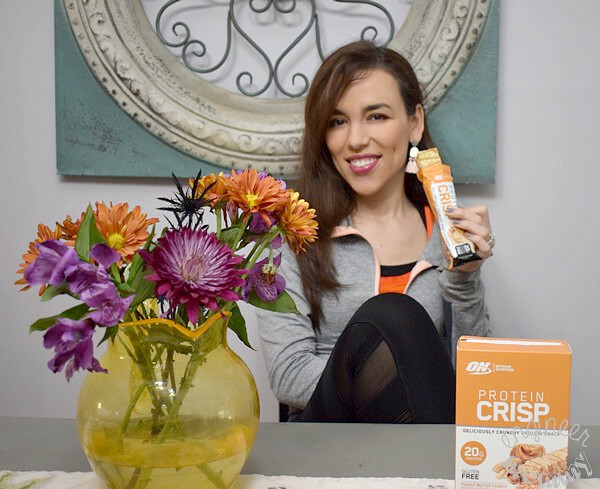 I recently discovered Optimum Nutrition products from Walmart and I’ve been loving these delicious, ready-to-eat protein options! 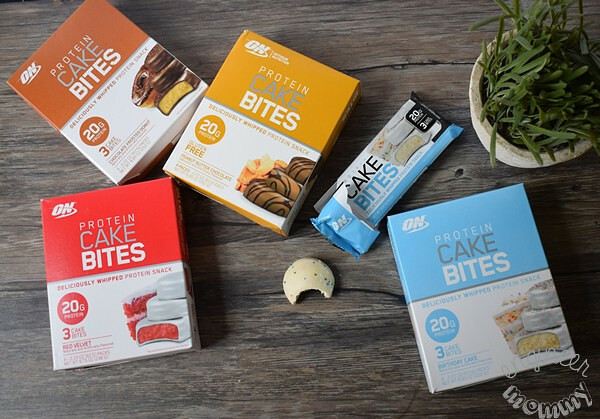 There are three products available: Cake Bites, Protein Almonds and Protein Crisps. These on-the-go sources of protein are perfect to help me reach my goals and keep me feeling satisfied between meals. Rich in protein, these snacks are the perfect post-workout refueling solution. 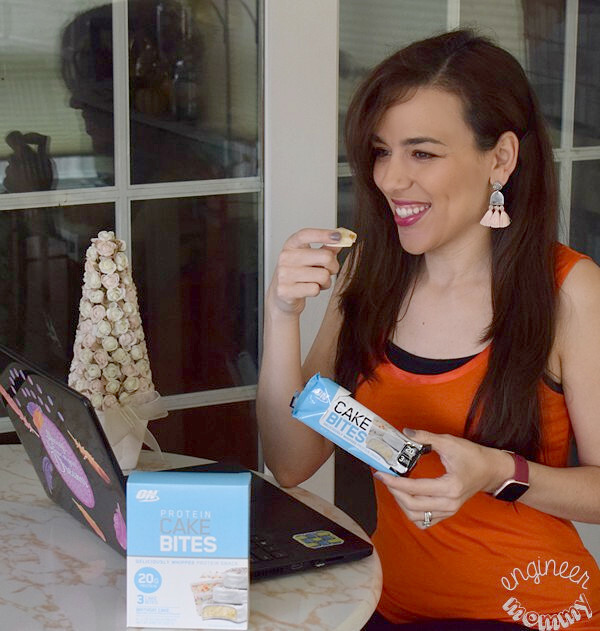 For example, the Cake Bites feature an impressive 20 grams of protein and only 2-3 grams of sugar. Oh, they’re also gluten-free so they’re perfect for those with sensitivities / allergies. The Cake Bites are available in three flavors: Birthday Cake, Red Velvet, Chocolate Frosted Donut, and Peanut Butter Chocolate. I like to keep a few of these at my desk for quick snacks while working on the blog. Birthday Cake is my favorite flavor, but I do enjoy all of them. 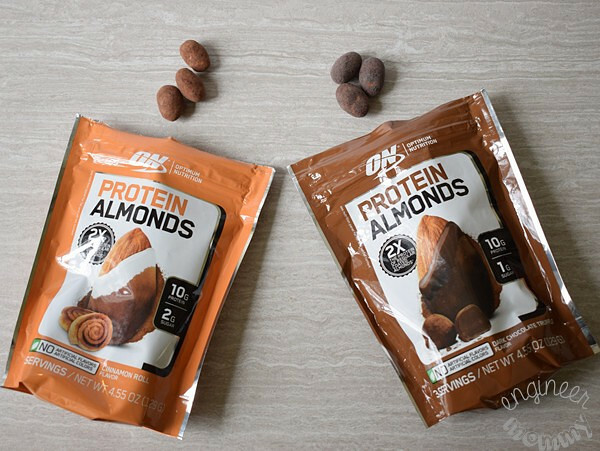 Another awesome option from Optimum Nutrition products is their Protein Almonds. These feature twice the protein of regular coated almonds, including a whopping 10 grams of protein per serving and only 1-2 grams of sugar. 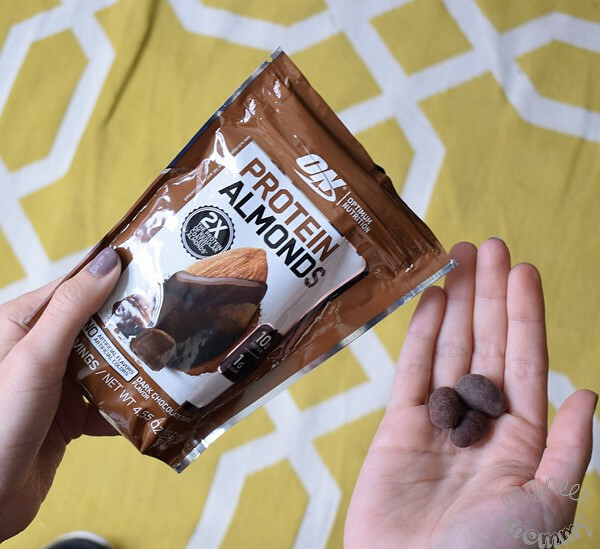 I am already a huge fan of almonds (and nuts in general) so these Protein Almonds are everything I love about almonds … but even better! They’re available in two yummy flavors: Dark Chocolate Truffle and Cinnamon Roll. I keep a bag of these in the car for on-the-go snacking. 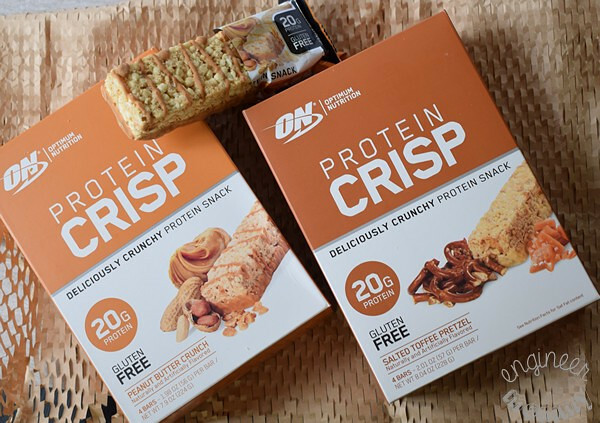 The third protein option I tried is the Optimum Nutrition Protein Crisps. With 20 grams of protein & 6-7 grams of fat per bar, this is a snack I can feel good about enjoying. The light, crispy texture and two delicious flavor options (Peanut Butter Crunch and Soft Toffee Pretzel) make this another favorite snack option of mine. Perfect to throw in my handbag, these Protein Crisps are the ideal snack choice for busy days. With all the protein per serving, they’re perfect after working out too! They keep me feeling satisfied without any of the guilt. Look for Optimum Nutrition products in-store at Walmart and experience the deliciousness for yourself. 3. Make a list of ways to recharge! Whether your favorite thing to do is take a bubble bath or dive into a good novel, cultivate a list of your favorite pastimes that recharge you. During the holiday season, there are inevitable moments of stress and frustration. When they strike, be prepared to reclaim your sanity by doing something that you enjoy! During the holidays, it can be tempting to squeeze in a few more productive hours in the day. 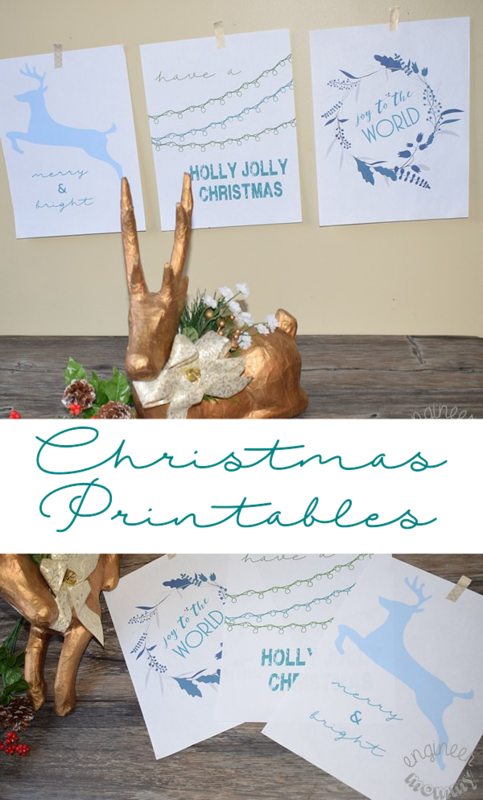 You may be tempted to do a late-night gift wrapping session or an early morning online shopping spree. You may feel like that extra hour (or two) of sleep is not that necessary, but we all need to recharge. Don’t skimp out on sleep – give your body plenty of time to rest every night. 5. Be comfortable saying “no”! Many of us have a tendency to take on more than we can handle. We might be uncomfortable turning down a close friend or not embracing an invitation for a fun trip, but sometimes there is just not enough time in the day. Feel comfortable saying “no” and see how much more time you’ll find in your day. Don’t over-fill your schedule. Laughter is just as important as making smart food choices and exercising regularly. I have found that humor is the best antidote to a stressful experience. In fact, laughing can be downright therapeutic and healing. How do you find ways to laugh often? My husband and I have developed a love for stand-up comedy. Also, my husband and I have cultivated a relationship, where we look for funny, silly things in everyday life… essentially, we are actively looking for instances to laugh about! Like many things, humor is a skill that improves with practice. Research has shown that exercise can help improve one’s mood and tolerance for stress. If you’re not already exercising on a regular basis, try to incorporate some workouts into your daily routine during the holiday season. You’ll be amazed at how just 30 minutes of walking every day can boost those feel-good hormones! Don’t forget to check out Optimum Nutrition products at your local Walmart store. How do you stay sane during the hectic holiday season? Which of these high-protein products would you most like to try? Don’t take on so much this coming months, learn to say no and do what is important for you and your family. Good snacks are important to have on hand. I have never seen these before, but I am looking for a snack that will not derail all the work I have done! I will have to look for these! They look really good! These do look and sound like some tasty snacks. I haven’t tried them before, so I need to! I do try to laugh more often! What great tips for staying sane during the hectic holiday season. I’m loving hard on those yummy snacks! What a great way to stay fueled up with extra energy. Those Protein Almonds look pretty tasty. That dark chocolate variety is definitely something I would try. No holiday weight gain over here. These are wonderful tips. These bars would be perfect to have on hand for the holidays. It is crazy how maddening the holiday season can be. These are some great tips though and are definitely going to help out a lot people, making sure you eat well and take time away is definitely a must. Snacks sure do keep the hangry away! I’ll look for these at the store. I love number 6. I think too often we get all caught up with the hustle and bustle and forget to enjoy it. These are great tips! I like your idea of changing the expectations. I always put so much pressure for the season to be so magical for my kids, and worry that I came up short. But enjoying the moment and time with them is what is important. Wonderful and definitely such worth to share. Holiday season is fast approaching! Such a very wonderful and timely tips. Optimum Nutrition looks like a nice company who are providing a good snacks that will suit to everyone’s taste and likes.